Kingwal wetland in Nandi County, Kenya provides numerous benefits to the local people. No research has been done to analyse and document its benefits to the local people to enable people appreciates and hence minimizes its destruction. The objective of the study was to determine the benefits derived by the local people from Kingwal wetland. Descriptive research design was employed in this study. Structured questionnaires, personal interviews, focused group discussions and field observations were used in data collection. Questionnaires were administered to 240 respondents obtained through systematic random sampling of households. Data were analysed using descriptive statistics and chi-square goodness-of-fit test. Results showed that 88.3% of the people derived various benefits from the wetland ranging from commercial benefits to nutrient benefits. A higher number of local people derived commercial benefits (42.5%) as compared to the rest. Chi-square goodness-of-fit test showed that commercial ; recreational ; nutritional ; water and socio-cultural benefits were significant. The study has revealed that Kingwal wetland provides numerous benefits to the local people and that commercial benefit is highest compared to the other benefits. The study recommends that a strong, active conservation-based educational program should be set and implemented to create awareness to the local people on how they can participate in managing the wetland in order to obtain more benefits from it. Wetlands provide goods and services to people living around and those far away from them . The goods and services range from food, water, herbal medicine and building materials  among others. They are therefore very important ecosystems  that should be conserved to meet the needs of the present and future human generations. They are important as they serve as wildlife habitats for resident and migratory wildlife species. Water flow accelerates the formation of the Convention on Wetlands of International Importance (RAMSAR) which was developed in 1971 and put in force in 1975 to ensure proper wetland conservation. The area occupied by world wetlands range from 8.3 million km2-10.1 million km2  and in Kenya, it is roughly 14,000 km2 . Kingwal wetland is one of the wetlands found in Kenya that has potential to provide most of the afore mentioned wetland benefits to the local people. In spite of the foregoing, the benefits of most wetlands including Kingwal have not been analysed to enable local people understand the importance of conserving them. This lack of knowledge has led to continuous destruction of most wetlands due to pressure from increasing human activities. Kingwal wetland is one of the important wetlands since it was documented to have the highest number of Sitatunga antelopes (200) in Kenya .Their number is decreasing due to habitat degradation and attack by farmers whose crops are damaged by the animals  and since they are rare animals  and are currently threatened, they are almost driven to extinction. To arrest this, there was a need to determine the benefits that accrue to the local people from the wetland so as to help in developing effective measures to promote sustainable management of the swamp and the Sitatunga antelopes in order to increase its benefits to the local people and minimize its destruction. Findings of this study will inform conservationists on the importance of Kingwal wetland to the local people with a view of garnering local support for wetlands and other protected areas. This will promote sustainability of the wetlands for the survival of the Sitatunga and other wildlife found therein. It is also envisaged that findings of this study will be used by policy and decision makers in coming up with effective measures to successfully conserve and protect wetlands rather than leaving them to be destroyed and degraded. This study aimed to determine the benefits of Kingwal wetland to the local people. Kingwal wetland is located in Nandi County, 25 Km from Eldoret town, about 400 km from Nairobi city and covers about 2.73 km2 . It runs from Kiptenden through Mosoriot towards Nandi North Forest in Mosop Constituency. The wetland receives water mainly from streams and springs around Kesses area and Kesses River flowing from east and drains into Kingwal (Kimondi) River while flowing to the west Kingwal wetland and its surroundings receive rainfall between 1200-2000 mm per annum. The area’s average temperatures range from 15°C-20°C during wet seasons and 24°C during dry seasons. It is well known as habitat for the endangered Sitatunga antelope (Tragelaphus spekei). Other wild animals found in it are mongoose, foxes, cranes, snakes, frogs, ant bears, and different species of fish. The wetland also harbors plants including trees, grasses, and shrubs  among others. The area around the wetland is largely inhabited by the Nandi, a sub tribe of the large Kalenjin tribe. They mainly practice crop farming of maize, tea among others. Other economic activities done are livestock keeping, agro forestry, bricks making among others. All these activities are sustained by Kingwal wetland . The study utilized descriptive research design, a design that involves expressing the features/characteristics of a given place/group/person. This design was employed because the study was interested in describing the benefits derived by the local people from Kingwal wetland and their economic value. The target population comprised of household heads of people living around Kingwal wetland, as well as community and administration leaders. Out of 2404 households living close to the wetland , 240 households were selected from which household heads were chosen to fill questionnaires. This sample size is 10% of the total population and was adopted from Mugenda  who advocated a sample size of 10% to 30% of the target population if the study population is below 10,000. After testing the validity of the structured questionnaires from 15 respondents selected randomly and the outcomes were positive, the study area was divided into three strata: upper, middle and lower Kingwal. Systematic random sampling was then used whereby every fifth household was sampled until a total of sixty from upper Kingwal, eighty four from lower Kingwal and ninety six respondents from middle Kingwal were achieved. Two groups from each of the three parts were organized for focused group discussions. Purposive sampling was employed in selecting key informants among them community leaders, community based conservation leaders, area chiefs, nature Kenya, Kenya Forest Service, Kenya Wildlife Service and National Environmental Management Authority representatives for interviews. Data were collected from both primary and secondary sources. Primary data were collected using structured questionnaires because they enable the researcher to cover a large area within a short time, those respondents that are not easily approachable can be reached through questionnaires, they are cost-effective and give the respondent time and space to express his/her views fully concerning the issues being sorted since they are made up of both open-ended and closed-ended questions . Personal interviews were also used for the key informants because they allow for verification of facts and more detailed information can be obtained. Focused group discussions were used since they give a wider picture of people’s knowledge and opinion concerning various issues and promote active and direct participation of local people in the research. Personal observations were used because first-hand information is obtained and it enables for verification of information given by the respondents. Data were analysed using descriptive statistics and chi-square goodness-of-fit test. Descriptive statistic was meant to show the frequencies and percentages of the different benefits derived by the local people from Kingwal wetland. Chi-square goodnessof- fit was used to determine if the specific benefits were significant or not at 95% confidence level of significance. Out of 240 respondents interviewed, 96 (40%) were from the middle Kingwal, 84 (35%) from lower Kingwal and 60 (25%) from upper Kingwal. A high percentage of males (69%) were interviewed than females (31%) and highest number of respondents aged between 45-59 years (41%), followed by those with 30-44 years (31%), then those with 60 and above years (16%) and the least with 15-29 years (12%). A higher number of respondents interviewed had no education (29.6%), followed by those with primary education (27.5%), then those with tertiary education (23.3%) and the least had secondary education (19.6%). Most respondents lived between 1.01-1.5 km away from Kingwal wetland (20.4%), followed by those living between 0.51-1 km (20%) and 1.51-2 km (20%), very few of them lived between 0-0.5 km away from the wetland. On assessing economic activities done by the local people for a living, results showed that most respondents interviewed were crop farmers (16.67%), a number of them combine crop farming with other economic activities for instance 14.8% are livestock keepers and crop farmers among others as in Table 1. From Table 2 above, higher number of respondents earn income of between 80,000-100,000 Kenya shillings per month (15.4%) followed by those earning 100,001-120,000Ksh and 40,001-60,000 Ksh (13.7%). Very few earn over 200,000 Ksh (4.2%). Table 2. Level of income. Most households interviewed had family size of four members (25.8%) and a few had over 10 members (0.83%) (Table 3). A significant number of respondents (χ 2 =144.150, df =1, p = 0.00) declared that they derived one or more benefits from Kingwal wetland (88.3%) while few do not (11.7%). The benefits obtained by the people are as shown in Figure 1. Figure 1: Benefits obtained by the local people from Kingwal wetland. From Figure 1 above, the benefit highly obtained by most people living around Kingwal wetland is economic benefit (42.5%). Other benefits obtained include water (34.6%), recreational (30%), nutritional (15.8%), socio-cultural (15.4%), medicinal (12.1%), educational (5.8%), flood control and air purification (10.8%) benefits. Economic benefits are obtained from Kingwal wetland by the local people through harvesting wetland grass for mat making (14.5%), livestock grazing (38.8%) especially during dry seasons, thatching residential houses (21.6%) and thatching business houses (11.8%); usage of water for washing vehicles (13.7%) and watering tree seedlings for income (9.8%); usage of wetland soil for bricks making (30%) and smearing houses (12.7%); extraction of firewood (10.8%) and charcoal (3.3%) from wetland trees. Nutritional benefits were obtained by the local people through the following: eating edible wild fruits (31.3%), eating fish from the wetland or reared using the wetland water (30%), using crop products irrigated using wetland water (40%) and eating game meat/bird meat harvested from the wetland (1.9%). Other nutritional benefits obtained by the local people from Kingwal wetland are the extraction of traditional vegetables like “black night shade (managu) and vine/climbing spinach Basella alba (nderema). Water benefits are obtained by the local people through the use of water from the wetland for irrigation of farms (42.5%), washing clothes (35.8%), washing utensils (38.5%), bathing (36.1%), drinking by livestock (34.9%) and washing car/motorbike (7.2%). The local people obtained socio-cultural benefits through performing circumcision/initiation rites (15%) within the wetlands and holding prayers (3.8%) near Kingwal wetland. Recreational benefits are obtained by the local people through photography (32.8%), game viewing (31.4%), bird watching (7.9%) and hiking (6.3%) around and along the wetland (Figure 2). Figure 2: Some of the benefits derived by the local people from kingwal wetland. Figure 2 above shows some of the commercial benefits derived from Kingwal wetland. 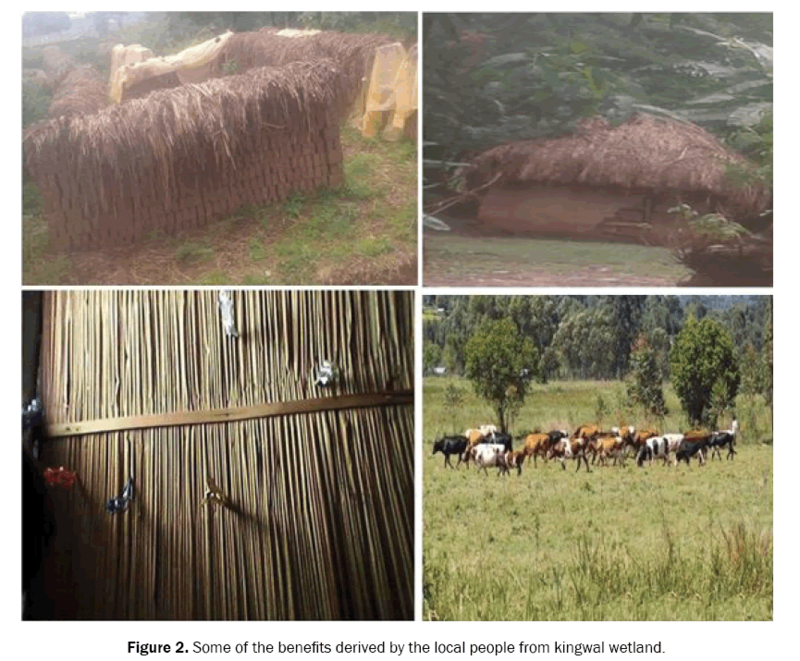 They include: bricks made by using Kingwal wetland soil, house thatched using grass from the wetland, mat made from reeds extracted from the wetland and livestock grazing on wetland soil. Wetlands were seen in the past as wastelands that should be cleared and used for other purpose because people did not realized how economically beneficial wetlands are to them. This research has revealed that Kingwal wetland provides numerous benefits and that commercial benefit is highly extracted by most local people than other benefits. A strong conservation-based educational program should be set and implemented to create awareness to the local people on how they can participate in managing the wetland in order to obtain more benefits from it and minimize its destruction. acknowledge the National Research Fund (NRF), Kenya for the financial support they gave me while I undertook this study. Baral S, et al. A total economic valuation of wetland ecosystem services: an evidence from Jagadishpur Ramsar Site, Nepal. Sci World J. 2016;2016. Mulei J, et al. Vegetation community structure and diversity in swamps undergoing anthropogenic impacts in Uasin Gishu County, Kenya. Afr J Ecol and Ecosyst. 2014;3:175-184. Lehner B, et al. Development and validation of a global database of lakes, reservoirs and wetlands. Journal of Hydrology. 2004;296:1-22. Kingwal Integrated Wetland Management Plan (2014-2018), Nandi County. A well conserved and sustainably utilized kingwal wetland with socio-cultural and economic benefits. Ministry of Environment, Water and Natural Resources, Lake Victoria Environmental Management Project Phase 2-kenya. Magut S. The Standard News, 15th August, Kenya: KWS secures dying habitats to save sitatunga. 2014. Matoke, T. Daily Nation News, 27th November, Kenya: Rare antelope population has fallen drastically in 10 years. 2017. Sitienei JA, et al. Impacts of anthropogenic activities and climate change on wetland ecology: Case of Sitatunga (Tragelaphus Spekei) at Kingwal Wetland, Kenya. East Afr J Sci Technol. 2012;1:1-8. Ambasa S. World Wetland Day celebration. Kenya. 2005. Kenya National Bureau of Statistics (KNBS). Population census results, Nairobi, Government printer. 2009. Mugenda A , et al. Research methods: Qualitative and quantitative approaches, Nairobi. ACTS press. 2013. Oduor FO, et al. To conserve or convert wetlands: Evidence from Nyando wetlands, Kenya. J Dev Agric Econ. 2015;7:48-54.